My second visit to the Manila Ocean Park is complimentary of my stay at Hotel H2O Manila. Unlike before, together with my family where we had limited viewing as the only available tickets are for the Trails to Antarctica and the Oceanarium, this time is different. On my first visit, we went there just before the ticket booth closes. This time, new attractions were given and we just have to be guided of the time set for the shows. Aside from the Oceanarium, we experienced the Sharks and Ray Encounter, Jellies Exhibit, Sea Lion Show and the Symphony Evening Show. All these in approximately six hours. The Oceanarium is home to 14,000 marine creatures from around 277 species, all indigenous to the Philippines and Southeast Asia. As we walk through the oceanarium, there are aquariums of varied sizes on display featuring colorful school of fish, sharks and sting rays with tags on the side for proper identification. Truly fit for an educational tour. The walkthrough features seven sections and contains 1,900 cubic meters of seawater. Similar to any other ocean parks in the world, the main attraction of the Oceanarium is a 25 meter long, 220-degrees curved walkway tunnel with a spectacular underwater view of amazing sea creatures swimming overhead. This is the most densely populated part of the Ocean Park that if you envision yourself to have a photo of yourself alone, it is close to impossible. The sideways are made standby area where some spectators sit for hours. But what is even more interesting with this installation is the fact that water source is filtered water from the Manila Bay. It is said that there is a special process done to ensure that the seawater is suitable to marine life. I was exhausted with the number of visitors on that weekend. But the same is expected anyway. And so we move on the next attraction, where the path is even more limited in space with stalls positioned on both sides. 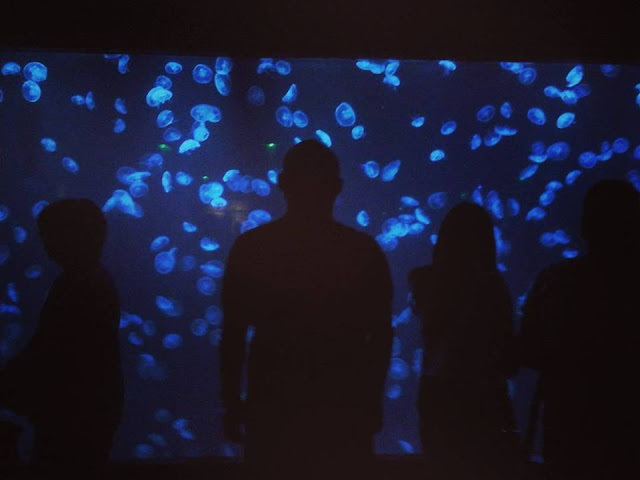 It is only this time I realized how beautiful and graceful jellyfishes are. During our stay at Hotel H2O Manila and with the visit to the Ocean Park, I have to agree that jellyfishes are the “dancing sea fairies” as they gracefully glide below and on the surface. But definitely only for the stingless and for those enclosed in a space. I could not imagine myself seeing them in the ocean while I swim. I would definitely panic. The various species are on display with multi-media effects and breathtaking music. It is truly pleasing to the senses and quite an innovative concept. The encounter actually presents a variety of ways. There is the aquanaut, full body and half body encounter but ours was of a dry encounter, which allows guests to touch the stingrays without getting wet. It was the shortest stint while we were at the Manila Ocean Park. The sharks and stingrays encounter is the most engaging animal interaction to date situated at the Acquatica area in their outdoor pool. The pool is divided into three zones filled with various species of sharks, stingrays and starfishes. The sea lions of South America bring valuable information on environmental conservation. The show features and highlights the special skills and unique characteristics of the sea lions. Honestly, I am not a fan of shows showing tricks of sea lions or dolphins. I want them interacting with humans while they are at the open sea. But maybe this is just one feature of any ocean park we have to get used to as the purpose is declared to be educational in nature and conservation awareness. No matter what your personal convictions are, still, the show is worth the time and commendation should be given to the hardworking trainers and the sea lions themselves. Our finale for the Manila Ocean Park experience was the Symphony Evening Shows. The symphony features the earth’s basic elements – water, fire, air and light to ignite Manila Bay’s night sky with larger than life distinct characters from the sea. The show makes use of the latest multimedia technology as well with a display of huge water fountains, the tallest in the Philippines reaching 40 meters or 120 feet. Symphony has more depth, creating a 2D effect as you enter an ethnic and mysterious world filled with new entertaining animated marine life characters in breathtaking fluid motion and vibrancy. I was actually waiting for the fireworks display but less were shown. We couldn’t help but compare it with other laser and lights show but this one might have a different market. The children I surmise is the target market. With the continuous shows and attractions visited at the Manila Ocean Park on one Sunday afternoon, I was exhausted yet contented. It was a fortunate event that slowly I am able to complete all attractions of the park offered to the public. Very nice entry! We would definitely love to see Manila Ocean Park again and enjoy their attractions.